When K and I got engaged, I knew I would be inheriting a large volume of video games and movies. However, unlike your casual gamer, K sees his collection as a permanent archival to be meticulously preserved and easily accessible in case he has the whim to play some old game like R.A.D. (Robot Alchemic Drive) on the PlayStation 2. Pros: Your media is easily accessible since cases can be stored upright on the shelves or horizontally in the drawers. 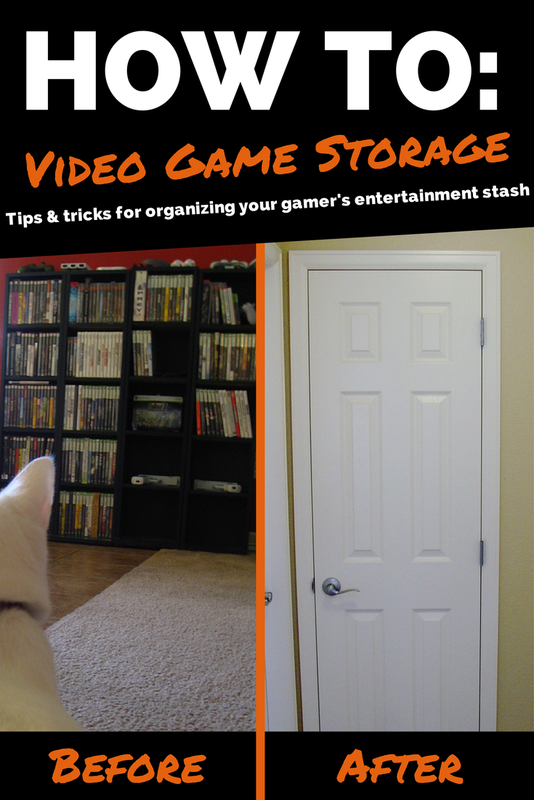 Cons: The drawers and shelves may not be exactly the right size for your stuff and it's difficult to increase storage space as you get new equipment or more games. Pros: The method is the best in terms of compact size that's very easy to hide away. 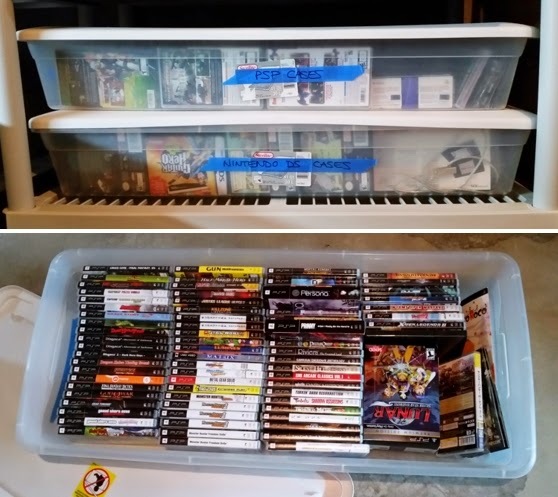 Cons: You can't keep the cases (if that's important to you), it can be harder to keep sorted if the pages aren't removable, you can't view all your options at once, and they aren't made to hold portable games. Note: We use this method for music CDs since we don't regularly access them once we rip them for our mp3 players. Case Logic is probably our favorite brand for electronics cases. Pros: Unlike cardboard boxes, plastic bins are more durable/waterproof and can come with clear lids. Cons: They usually come with slightly slanted sides that don't exactly fit game cases, it's easy to overload them in terms of weight, and it's still less accessible than a bookcase. Note: We got the kind that fit under the bed because then the games are stored in a single layer and are all visible at once. Wish we had gotten ones with clear lids though. 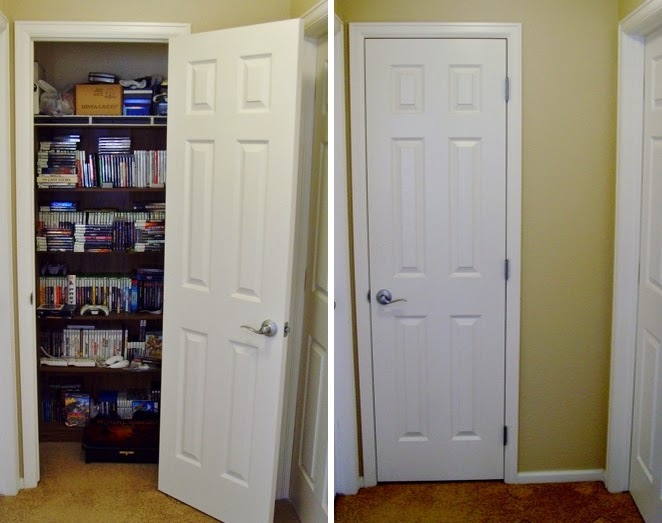 We use them to store portable games and any overflow from our "premium storage space" (see below). As for his extensive movie collection, we have a convenient landing in the middle of our basement staircase. Bingo! Again, another concealed location behind closed doors. So when we invite guests over for movie night, they can just pop down a few steps to view our entire offering. Hope you enjoyed the first post in my "Home Is Where the Console Is" series. If you have any topics you'd like me to address on tips and tricks for living with a gamer, leave a comment! How do you store or organize your media collection? 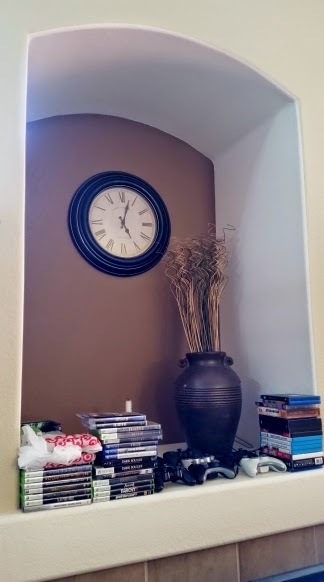 Does it take over your living room or do you have clever ways of hiding it?